I was diagnosed with a heart murmur at the age of 4. It took another 12 years before doctors discovered the murmur was the result of a bicuspid valve. Annual visits to the cardiology department at the local teaching hospital were tiring but necessary. Interestingly, I don’t remember any doctor ever telling me or my parents that surgery would be in my future. Fast forward to age 24, I had my first job and was living on my own in a new city with a new cardiologist. He was the first to tell me that it “could be six months and it could be six years,” but I would need a valve replacement. As years went by, I thought he was just being overly concerned. I passed the six months; I passed the six years; my cardiologist retired. As a child and young adult, I had never been much of an athlete. 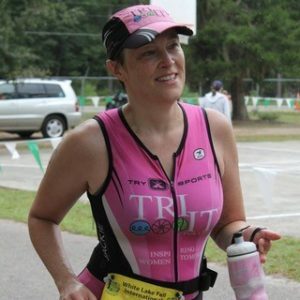 At age 46, for some reason, doing a triathlon was on my bucket list. 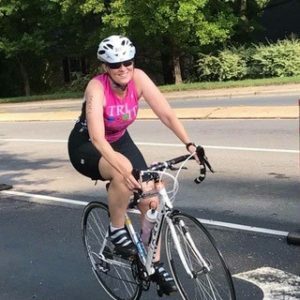 I joined an all women triathlon club, Tri It For Life, and with the blessing of my new cardiologist started training for my first triathlon. 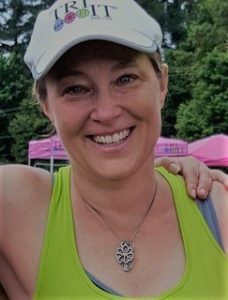 Over the next three years, all went well through nine triathlons, two half marathons and innumerable charity bike rides and 5K runs. Until the day it didn’t. I found myself struggling to catch my breath and fighting to get up the hills. I chalked it up to not training hard enough and approaching the big 5-0! Until the heart pain. Incredibly, my cardiologist had an opening for an appointment the day I called. Four days later they performed a CT of my ascending aorta. Two days later they performed an echocardiogram. Six days after that, it was time. My valve was worn out, and my aorta dangerously dilated. On June 6, 2016, I underwent AVR and aortic graft. 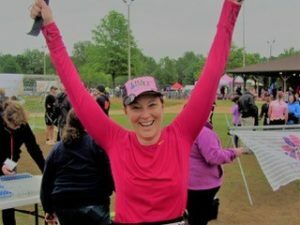 As scary as the surgery was, I found that my grief was largely focused on possibly losing the active lifestyle and incredible community I had found. My triathlon club was so supportive. One of the newer members of our group had undergone open heart surgery eight years before. 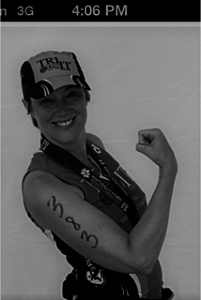 The day before my surgery, I watched her cross the finish line of her first triathlon and knew that I would be back. Recovery was harder than I thought, and the depression was very real. I had this irrational fear that if I pushed myself too hard I’d look like a scene from Alien with gross stuff flying out of my chest. I finally accepted that I wasn’t going to explode. With friends, family and cardiac rehab, I started back with my tri group. I was cautious at first but eventually rediscovered my confidence in my body. I’m back in my full swing and although I’ll probably never earn a 70.3 or 140.6, I am happier than ever to be swimming, biking and running!